Ras Beirut Baptist Church is one of four Baptist churches around Beirut. They are based in the centre of Beirut but have also been working in a suburb of the city into which have come many refugees from Syria. They continue to come and they continue to go as they are processed by the UN. By far the majority that come are Moslems who have lost everything. The church has a number of ministries for the refugees and are empowering Syrian people to help and serve their own people. This is not easy as the Syrian Christians are also refugees and wanting a better future outside the Middle East. They are seeing many come to faith and being baptised. They baptised 37 people in an 18-month period in 2015/16. The new restrictions (early 2017) placed by the US on refugees has meant that many in process now do not know what will happen to them and if they will ever be allowed to leave. However, some Syrian Christians have decided to stay to minister to their people. 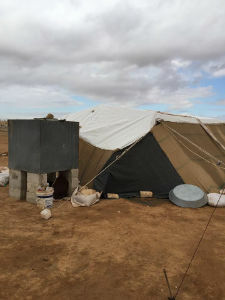 The foundational components of this partnership are: 1) to support some key personnel as they work with the refugees and 2) to provide medical assistance and medicines, food and clothing to refugees through their church network in Beirut. The initial components of the partnership are based in and around Beirut, largely with Syrian and Iraqi refugees. However, there are many other aspects of this partnership that could be developed around the Moslem world. Ras Beirut Baptist Church was formed more than 70 years ago by missionaries. It has a proud history of ministry in this part of the world. During the internal conflicts in Lebanon it was difficult to keep operating and many of their congregation were badly affected during that time. Since the conflict in Syria and Iraq, they have sought to be a place of ministry and serving the community. They are well respected in the community. BHW's New Partnership Facilitator first met Charlie in 2015 and then visited him again in November 2016. They regularly communicated and in May 2017 a decision was made to commence a partnership. The refugee families that come into their sphere of influence are the primary beneficiaries here. 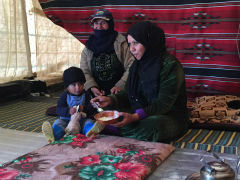 Most are moving through Lebanon but their present circumstances are pretty dire and many have lost hope in the process. Most of those coming to Lebanon are families with children. They are dealing with some of the poorest people on earth right now. They have a church based, holistic ministry that is well established. They have a great network of people on the ground and are already delivering care. Charlie Costa is Lebanese/American and is married to Mona. They are missionaries with the Baptist Missionary Association of America. They have two children. 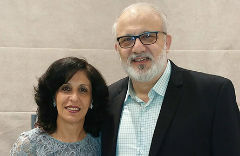 Their son Joe is married to Mira and they currently live in the USA but intend to return in September 2017 to commence ministry to the youth among the refugees. Charlie's daughter Rana is married to Elie and they have two young children. Rana is in full-time ministry as a doctor and works with her parents, organising the medical work. Charlie is the senior pastor at Ras Beirut Baptist Church as well as overseeing many other ministries. He is pastor of Insight for Living Arabic and the voice of Nafitha Ala Hayat, the Arabic-language broadcast of Insight for Living. He also serves as a magistrate of the Family Court of Appeals for the Evangelical Community in Lebanon. Charlie is engaged in planting churches in the Middle East and is a published author. He also acts as the supervising editor for Chuck Swindoll's books translated into the Arabic language. Pastor Bassam runs the refugee support and intervention programme and is a very sharp guy with a great team. He is a part-time pastor and is an insurance agent by day. He is totally passionate about the work and leads the Syrian refugee church. He is such a servant, as is his wife Nada. Nada is a trained counsellor and provides this service free to any of the refugees. They are obviously loved by the congregation. The vision is to come alongside the refugees with holistic love and care and serve them in the name of Jesus. They have seen hundreds come to faith. They have a few people they remunerate to deliver care. This care includes visiting families and helping to arrange accommodation, sometimes emergency accommodation as the cost of rentals is crazy as there are not enough houses or apartments available. They provide trauma counselling and friendship, food packages and emergency relief, and medical assistance for as long as it is required. For some this is years. In addition, they facilitate church activities, particularly for the Syrian people with Syrian leaders. This includes discipleship, teaching and worship. Those being resettled outside the Middle East are leaving with a strong Christian foundation and are becoming influential among their people once they get to their destinations. There is an increasing focus on the women and children as they are the most vulnerable. 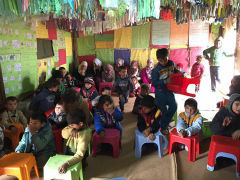 This has meant their facilities are now too small as there are many children. Getting them into some form of education is also an increasing issue. One man, Assyrian Orthodox, had murdered a man before coming to Lebanon. He was a hard, violent man with a drinking problem. He fled Syria because of the war and found himself in Beirut where he discovered Christ. His life is totally changed. He now virtually lives at the church building and serves whoever comes along. Myram is a beautiful young woman. She comes from a Moslem home and through her friend, came to know about Jesus. Finally, after a long time, she changed her allegiance and since then her sister has as well. She is not particularly welcome at her old home but her mother still loves her. She was encouraged to apply to go to the USA but has decided that she will stay in Lebanon to serve her Syrian people as they are in such trauma. She works in a part-time role serving the people, especially the newcomers, and would love to do this for as long as it is required. One day she would also like to go back to Syria and help there too. Myram is one of the people that this partnership would be supporting.